Unless you’ve been living under a rock, you know that Philadelphia is apparently the new hot spot for coffee. There are lots of indie shops popping up, and instead of brewing local la colombe, they go for counter culture or stumptown. 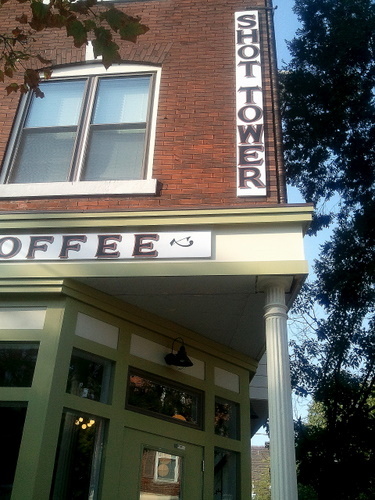 Amongst one of these newest spots is the gorgeous Shot Tower Coffee. It’s even cool and inviting from the outside. You can enter from this beautiful entrance on the corner or a nicely hidden door on the 6th st side. This place is surprisingly huge and unbelievably sunny. It’s not one of those teeny shops crowded with lots of tables. It’s really roomy and really only has one giant communal table with individually attached and swivelling benches, and some bar space along the windows. I love how uncluttered it is. They were playing strangely old throwback tunes. We couldn’t possibly believe that the young baristas would have known any of these songs, which probably came out when they were still in the womb. It’s been sweltering out, so the thought of a hot coffee is quite frightening. 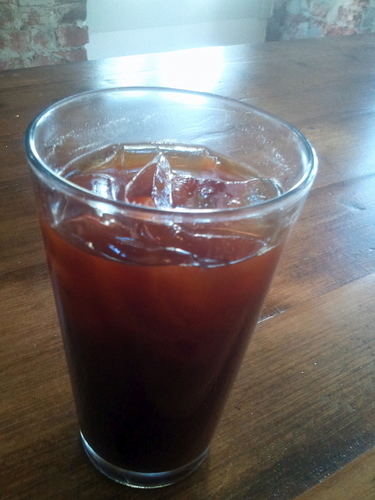 Here’s a delicious iced americano. 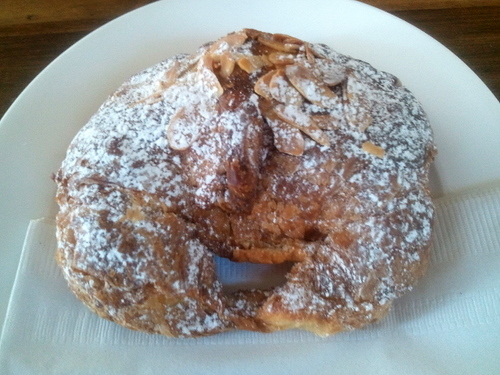 And here’s an almond croissant that B proclaimed as the best croissant he’s ever had. Or maybe it really was the best almond croissant he’s ever had. Regardless, it’s a great one! Flaky, filled with almond paste, topped with toasted almond sliced, and dusted with powdered sugar, it was rather great. 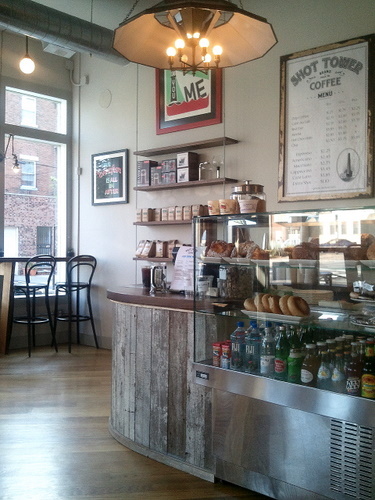 Shot Tower is bright, roomy, friendly, rather peaceful, and serves good coffee and food. What more do you need?